How then did you meet your “unknown teacher”? Some of the friends I met, and with whom I spoke of peace, freedom and joy, had a spiritual guide. One day I met their teacher and on this and several other meetings, I asked him many questions, questions that expressed all my earnestness to find my real center. It seems that you trusted him at once. I was open to him. I was struck by his lack of striving, his humility. He never tried to impress or convince. There was simply no personality. All his answers came from nowhere, no one, and yet his gentle openness was apparent. I was struck too by his argument that potentially you are, it only needs actualizing. He never saw anyone as not knowing. He gave no hold to my personality. He gave me many answers, but during the several weeks that I didn’t see him I became aware that all my questions had been an escape, an evasion of the real question. The existential crisis I had always lived in became acute. I lived with this feeling that I had missed the real question, a question I was not able to formulate. Then I had the opportunity to visit him where he lived in a little room in the Sanskrit College at Bangalore where he was a teacher. Two other young Indians were present and they were talking about the Karikas of Gaudapada and the Mandukya Upanishad. The talk was of the four states, waking, sleeping, dreaming and turiya (the absence of objects). He said that turiya is not properly speaking a state which one enters and leaves. It becomes a non-state (turiya-citta) when you are awake in it. It is the absence of ourself which is our total presence. Then there was a silence, the other students left and he suddenly looked at me and asked, “Do you know yourself?” I was a bit disturbed by this question because I didn’t really know what he meant. I couldn’t find a way to look at it. I said hesitantly, “Yes,” because I was thinking I knew my body, senses and mind very well. He said to me, “You are the knower of your body, senses and mind, but the knower can never be known, because you are it and there’s nobody to know it. It can never become an object of observation because it is your totality.” This saying had a very strong impact on me. I had a glimpse of reality in this moment because it stopped all intellectual faculties. We were silent and I left. And did this impact remain with you when you got home? It left a very strong echo in me of freedom from old beliefs. I went home and lived with it free from all conceptualization and felt myself awake in this not-knowing. It was completely new, there was no absence of knowing. Did life change or go on as usual? Life went on, eating, meeting people. But there was now a feeling that I was behind all daily activities. I saw Pandiji many times afterwards and realized that he was my guru because this profound impact could only come from a guru. So you see he found me when I was not looking for him! Were you at any point in the quest convinced that you would one day know your real nature? Yes. After the first meeting with him in Bangalore. I never formulated it. It was never a goal. The word “enlightenment” never entered my thoughts. Pandiji certainly didn’t use the term. It was simply a lively feeling, without formulation, of being free from myself, free from all restrictions, all ideas, free from the knowing of freedom. Did you ever spend a lot of time together, live together? Yes. For three or four months. Is it important to live with the guru? No, it’s not important. He stayed in my house purely for practical reasons. How did you spend the time together? He was teaching at the college all day. Sometimes we ate together and every morning he knocked on my door very early and we sat together in silence. Sometimes we spoke about the scriptures, because, being a man of tradition, he very often referred his sayings to the scriptures. But he never did so arbitrarily. Each time he spoke this way, it was exactly the moment when I needed to know it. There was really a feeling of oneness. I was not aware of a “me” and a “he” in our being together. There was real love, not in the way we are accustomed to mean it. It was the most exalted being in love. His presence was continually drenched with warm feeling. Did he ever transmit to you through touch? That was not his way with me. We communicated mostly through the eyes. Sometimes he touched my shoulder or hand, but our closeness was closer than all touching. We also walked together. He was an admirer and this appealed to my artistic nature. He loved music and singing and could imitate the sound of any bird. Were there any disciplines or exercises that he taught you during this time? Only to be aware of when conditioning comes in in daily life. He emphasized the problem of day-dreaming and strategy-building. He also emphasized that one should never push away conditioning but only see it clearly, and he reminded me to constantly refer to the first insight, the first non-experience. You mean, to remember it? Go knowingly in it, not remember it intellectually. It is presence, not a memory. Did he teach you any yoga exercises? No, it was not on the program! When we were sitting together he occasionally made me aware of certain patterns. I knew a few yoga postures already and, if he found me doing them, he sometimes corrected them. Mostly, we sat. Our togetherness, our meditation was never intentional. He emphasized only awareness free from objects and not to try to become a better man. Doing things was a defense for him. His presence was all that was needed—and his sayings, the way he brought the truth to me through words which emphasized the silence. He emphasized the silence after the sayings, the silence in which understanding becomes alive, free from words. Was he in your thoughts very often? I did not think of him because I could not personify, objectify him. There was a deep feeling of oneness. I was not at all attached to his physical being. Everything he gave was a pearl. I took it as a pearl and lived with it. There were moments when we were just happy to be together, not talking, not thinking. His presence was my presence and my presence was his presence. His being was the transmission. In a real teacher this is all transmission is. Any intentional transmission is sentimentality, romanticism. You have often said that you like to be pushed into the corner with questions. Did you do this with your teacher? Did you ask many questions? Oh yes, many questions! These brought us to the edge of thinking. They exhausted thinking. Were your questions ever of a practical nature, how to conduct your daily life and so on? Almost never. I tried to use all my knowledge to solve the problem myself. I had a very great veneration for him and when I really looked at my feelings, I did not want to bother him with things I could solve myself. I left my time with him for other questions. Would you mind my asking whether you remember any of the questions you asked him? You obviously have a very good intellect. Would you say your questions were intellectual? As you say, my intellect was a very good tool and I used it, but my questions arose not from the mind but from my existential conflict. As I had a strong intellect, I went as far as possible with my questions. For me the intellect was a vital element in the search. Sometimes he answered me in the form of a question which gave me no hold. He pushed me to the edge of the thinkable. Sometimes he did not answer verbally and that silent answer was even more tangible. Would you say your approach was more jnani than bhakti, more the way of knowledge than devotion? But you can only come to knowledge when there is love, unconditional adoration. Were you ever curious about him, about his life, his role as a teacher or as a man, possibly as a husband or father, how he related to other students and so on? No, never. I never asked personal questions and I never spoke personally about him. It was a sacred relationship. It was a profoundly serious togetherness. I never doubted his integrity for a moment. At this time, even though you knew intellectually that there was nothing to achieve, did you still feel and function as if there was? No. There was no thought at all of becoming or attaining. The most I could say would be that perhaps there was still a residue of eccentric energy, energy to become. But every time I was with Pandiji, his presence channeled the energy that was dispersed. Then it is important to spend some time with the teacher? It is not a question of time. It can happen at any moment in life. But there are people who have a slow intellect, slow understanding, or who are stuck in the garage. It can also be that they have such conditioned minds through years of wrong training that the mind has lost its subtlety and is the same as a slow mind. You had, I believe, at this time some freedom from family and financial obligations. Yes. I had previously organized my life to make this possible. You are aware that many people wonder whether to organize their lives to be more free from their obligations and social responsibilities. Do you think that a serious inquirer into truth should do this? One should do all in one’s power to realize this for some time. It usually means foregoing material wealth, letting go of a way of living, living in the most functional way: food and sleep. This comes from the calculating mind. It is a statement from complete ignorance. There is nothing functional in this reasoning. It is only postponing. The right moment does not come from the mind. When you feel the urge to leave the competitive world, the desire is very strong. You don’t, of course, avoid your family responsibilities, but you see them in a different way. The reasoning to make enough money to retire on is an escape from what belongs to the immediate moment. But what if one has several children, for example, and simply cannot change one’s job? What is important is that you feel the inner need to be. Then your surroundings—what belongs to you—arrange themselves accordingly. Existence on this earth gives everyone the opportunity to know Life and to be awake in Life. What we are looking for is our nearest. I am interested to know why, though your teacher never emphasized yoga, you pursued your study of it, presumably because you still had an interest in the relation between biology and psychology. Was this why you went to learn yoga with Krishnamacharya? Yes. But I was not at all attracted to yoga from the exercise or gymnastic point of view. I wanted to become more conscious of the body. I wanted the body to become more subtle, more energized, more expanded. It was for the love of feeling the body elastic and receptive. And he was a lovely man to meet. Was this before or after the awakening? …Did you see other teachers on the level of Pandiji while you were in India? I saw Krishna Menon four or five times later on, and found him highly able in vidya vritti, the formulation of what cannot be formulated. Absolutely a beautiful being. Unfortunately I never met him because he passed away a few months before I arrived in India. So while you were a disciple of Pandiji’s you were never drawn to other teachers for clarification? How long did you live in this way, seeing Pandiji? And then you left Bangalore and went to Bombay? And during this stay there was the moment of enlightenment? Yes, it was a total switch-over from the residual conditioned state to the unconditioned state. Awareness expanded completely and I felt myself in globality. No. There had been glimpses, but this was more than a glimpse. There was no going back. I had found my real ground. Did you know in the moment itself that it would be permanent or did you discover this in the days that followed? Because of the quality of the switch-over there was no doubt that I could be again taken by duality, and this was confirmed in the days and weeks that followed. I felt a rectification in my body and in my brain, as if all the parts had found their right place, their most comfortable position. I saw all daily events spontaneously appearing in the non-state, in my total absence, real presence. Could you say what were the exact conditions, physical and mental, before this moment: The Threshold? There had been, for two years, a retreat of all the energy commonly used in becoming, so that when some flying birds crossed my horizon, instead of becoming lost in them, they were lost in me and I found myself in awareness free from all objects. This time what I admired, the birds, dissolved in my admiring, in presence. And admiring dissolved in the Admired. Before the birds appeared, I had been in a profound and prolonged state of being open to openness. Now I found myself as the openness, identical with openness. Openness was my being. There was no more duality. Was there any other difference between this time and other times when you had looked at birds? Before, there was still a looker looking at something. This was a moment when there was simply looking without a looker. Previously, it had become my nature to live in pure perception with objects, not living in the divided mind. I had for a long time ignored the arising of all qualifications. It belongs to the traditional approach, and so that of my teacher, never to refuse or indulge the coming up of qualification, but simply to ignore, and eventually forget them. Neither to look for freedom nor avoid non-freedom. The mind simply ceased to play a role except in a purely functional way. So in a certain way you were ripe for the moment? In other words the moment was waiting for me! There is no more identification with time and space, body, senses and mind. All events happen in awareness. There was no more relationship. As there’s no longer an “I,” there is not another. Can this non-state be described at all? It is love where the mind is dissolved in love. 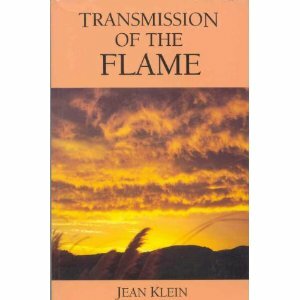 Interview with Jean Klein taken from the prologue of Transmission of the Flame. Third Millenium Publications. 1990.